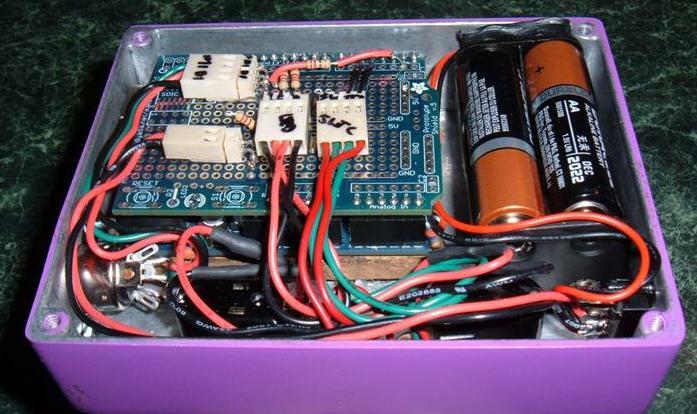 Having ‘completed’ my Arduino ‘stomp box’ project I immediately realized that I needed it to do more (of course!). Originally my intention was to have one switch control the wet/dry mix on my effects unit and the other to control the selected patch, flip flopping between them, all pretty simple stuff. But then I thought about ‘soloing’. My MIDI keyboard controller (a keytar) does not send MIDI volume information, nor can I program it to do so, so I needed some way to be able to easily switch from normal playing mode (medium volume) to solo playing mode (boosted volume). 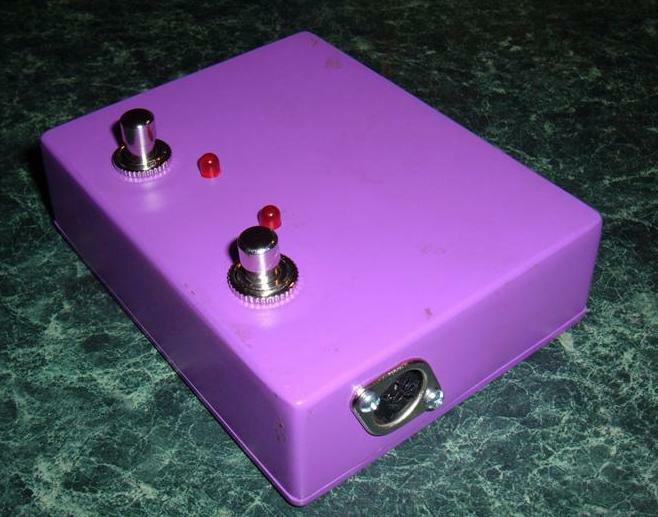 Guitar players usually have a pedal they just stomp on to boost the signal to a pre set level for solos so I figured it’d be useful to be able to do that using my stomp box. The two switches gives me four conditions, although because you cannot really use the normal (I.E. not pressed) state that leaves three conditions. Left button pressed, right button pressed or both pressed. Since I was using the first two conditions already that left the ‘both buttons pressed’ condition to use to switch between normal and solo mode. Well that turned out to be a lot more complex that you’d think. I could not simply look at the switches and wait for them both to be pressed because the chances of my foot hitting them both at the exact same time is pretty much nil so the code would always detect one or the other on it’s own initially and I was using that state to switch the mix or patch. Waiting to see if the other switch was pressed was not really an option because how long do you wait? What is interesting though is that a binary switch has more than just an on or off state. It also has the ‘changed state’ condition. I.E. It was open but is now closed and it was closed but is now open, often referred to as leading and trailing edge (of a square wave which is what you’d see on an oscilloscope if you tracked the voltage on the switch contacts). So what I did was to switch the mix and patch selects to work on the trailing edge signal, that is when you release the switch and I made the volume switch occur on the leading edge, that is when both switches closed. That way I could distinguish between the events quite easily. Originally I hard coded the normal volume level but than I thought, well what if I want to change it for a particular setup (I figured leaving the ‘solo’ setting at max all the time was fine), I’ve only got two switches and I’ve used them all and how do I indicate what is going on to the user, I’ve only got two LEDs? Well it turns out a switch can have yet another state and that is how long it has been pressed. Since the mix setting now triggers on the switch release, I can now time how long a single switch has been pressed and if it exceeds a certain time (I figured five seconds was a good value, not too long, not too short) then I put the unit into ‘program’ mode. To indicate this to the user I made the LED next to the switch flash. Once in ‘program’ mode I can listen for the other switch being pressed and each time it is pressed, increase the ‘volume’ setting. Rather than have the user step through 127 values I figured having ten steps would be enough that I convert into MIDI signal levels by multiplying by 12 which gives me ten settings of 12 through 120. To indicate the current volume ‘setting’ I make the second LED flash using a slow setting for the lowest volume and increasing the speed for each click up to ten at which point it cycles around back to the lowest setting. Pressing the first switch again takes it out of program mode and saves any new volume setting. The chip on the Arduino has 1024 bytes of EEPROM that can be used to save data even when the device is turned off. So after setting a new volume I now save the setting in the EEPROM so that when the device is switched on I can restore the volume setting from the save value in the EEPROM. I also flash the second LED one to ten times (depending on the save volume level) at switch on to indicate to the user (me!) the current ‘normal’ volume level in use. I have been very impressed with the quality of the Arduino IDE and the programming libraries available for it. In the past I have done micro processor (PIC) programming but used assembler. That’s fine but you have to do EVERYTHING yourself and testing can be ‘interesting’ to say the least. Writing in C and using existing libraries made development and testing very easy and speedy, especially when used in conjunction with the Arduino IDE’s ‘serial monitor’ and loads of debugging messages in the code (wrapped in #if defined statements so I can easily remove them for the ‘live’ code). If I have on criticism of the Arduino IDE (or rather the doc) it is that as well as the extensive Arduino specific libraries you can also use code from the AVR project, which I wanted to do for the EEPROM support since it has more function (block read/write) than the Arduino library. However even though the AVR library is included in the Arduino IDE, it is not very well documented in the Arduino doc. It was only by chance (thank you Google) that I even came across the AVR library and I then spent quite a long time trying to figure out how to add it to the Arduino IDE before I found that it was already there. The missing components turned up so I spent a day building the MIDI interface board. Figuring out where to place the various connectors and components on the prototyping board so that the connectors were not blocked by the sides of the box it would all live in was far harder than writing the code or designing the circuit. Once I had it all hooked up I tried it and…. nothing! Well, the switches worked as did the LEDs but I was not getting a MIDI signal out of the box, or if I was the other end was not detecting it. When I looked at the circuit for the commercial MIDI interface board I had it was a lot simpler than my over engineered effort so after some hesitation I ripped out the output circuit from my board and replaced it with a much simpler version based on the commercial units circuit (basically one wire and a couple of resistors, no transistors). Swapped over the output cables to account for the circuit changes and tried it…. nothing again! Now had been very careful about hooking up the output wires to the MIDI connector the right way around. Seems I was not careful enough! On a whim I swapped them and of course it worked. It was probably OK the first time, just the had the wires the wrong way round but at least it works now. As you can see pretty cramped. The board you can see is the MIDI interface board I made. The Arduino is underneath that screwed to a piece of board that is then glues to the case to hold it in place and insulate it from the metal box. I always think that it is a shame to hide all the electronics as so much effort goes into creating it. In some ways it’s like programming, you can put a lot of effort into making some code as elegant as possible but in the end, all people care about is ‘does it work’. The power switch is on the other side of the box but that’s it. The left button controls the bypass on the effects unit and the right button switches between two patches. The LEDs just indicate the current setting that is selected for each switch. All pretty simple.